Samsung Gear S3 Classic vs Frontier is a comparison between two outstanding smartwatches that has the potential to keep a tab on all your activities. As both smart watches have great features, people like to check the Samsung Gear S3 Classic vs Frontier comparison. In terms of quality, performance, and features, both watches are fantastic in their own ways. Both Samsung Gear S3 Classic and Frontier have earned the tag of Amazon’s choice smart watches. But, which one you need to select, it remains unanswered if you do not go through the Samsung Gear S3 Frontier vs Classic comparison. Which Is Better, Samsung Gear S3 Classic vs Frontier? With the built-in S-health app, it tracks heart rate, steps, and also has other fitness tracking features. Samsung Gear S3 Classic has built-in GPS, gyro, Ambient Light sensor, accelerometer, and barometer. It is dust-proof and water-resistant. The Samsung Gear S3 Frontier is similar to the Classic version. It also has a built-in S-health app that is responsible for all fitness tracking features it has. Frontier also has built-in GPS, gyro, Ambient Light sensor, accelerometer, and barometer. It is also water-resistant and dust-proof. Classic, just like its name, has a classic look. The Gear S3 Classic has a black leather strap that can be changed with any regular strap having a size of 22 millimeters. The buttons have a metallic finish. It is made up of stainless steel having a touch interface. Classic has a dimension of 46 x 49 x 12.9 mm. The Gear S3 Frontier has a rugged look giving a rubber strap as standard. The standard strap can be switched with any standard watch strap having a size of 22 millimeters. It has a textured and large buttons. Similar to classic, it has a stainless steel body with the touch interface. It has a dimension of 46 x 49 x 12.9 mm. Classic has a non-removable battery having a capacity of 380 mAh. With this battery capacity, the battery life of the smartwatch is 4 days. It has a WPC inductive wireless charger to charge the watch. 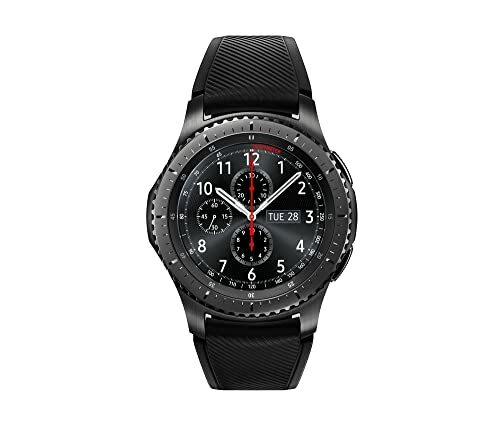 Gear S3 Frontier is no different than Classic as it also has a 380 mAh non-removable battery. With a single charge, it can last up to 4 days. The WPC inductive wireless charger is used to charge the smartwatch. The Gear S3 Classic works on the Tizen operating system. It is controlled by a combination of twin buttons, rotating bezels, and touchscreen. It has many latest apps than ever before such as Spotify and many others. It has a Dual-core 1.0 GHz CPU, Exynos 7270 chipset, and Tizen-based wearable platform 2.3.2. 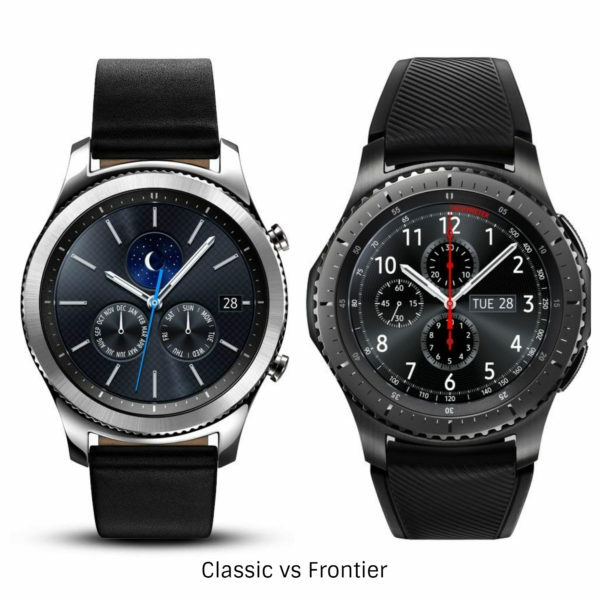 Frontier is similar to the Gear S3 Classic. It also works on the Tizen operating system. Just like classic, it is also controlled by a combination of twin buttons, rotating bezels, and touchscreen. The user will get to see many latest apps such as Spotify. There are many other useful apps. It also has a Dual-core 1.0 GHz CPU, Exynos 7270 chipset, and Tizen-based wearable platform 2.3.2. The Samsung Gear S3 Classic has always on-screen that makes it easy to read the fitness stats and all-day activities for the users. The screen is always active. It has the ability to show animated display all because of the full array of 16 million colors. The Samsung Gear S3 Frontier is just like the Classic. It also has an always on-screen that makes it easy to read the fitness stats and all-day activities for the users. It has a circular Super AMOLED display of 1.3-inch having a resolution of 360 x 360 pixels, which is equivalent to 278ppi. Classic has a corning gorilla glass to protect it from scratches and drops. The Frontier also has a 1.3 inch circular Super AMOLED display. It is capable of displaying a resolution of 360 x 360 pixels (278ppi). The corning gorilla glass protects the screen from drops and scratches. Samsung Classic has an internal storage of 4GB and a RAM of 768 MBs. It has a dual core processor of 1 GHz. The Gear S3 Frontier also has an internal storage of 4GB and a RAM of 768 MBs. Just like Classic, it also has a dual core processor of 1 GHz. Classic can be connected to everything with the WiFi b/g/n, 3G/LTE, MST, NFC, A-GPS, and Bluetooth 4.2. The connectivity option of Frontier is similar to the Gear S3 Classic. It has a Samsung pay feature that allows the user to pay the bills. Plus, Classic has rotating bezels. Frontier also has a Samsung pay option that makes the payment process simpler. It also has rotating bezels. It does not have a voice call option. It has a voice call option. It weighs 57 grams with a dimension of 46.1 x 49.1 x 12.9 millimeters. Frontier has a weight of 62 grams, which is a more than the Classic. It has a dimension of 46.1 x 49.1 x 12.9 millimeters. Now that you have gone through the Samsung Gear S3 Classic vs Frontier comparison, you already aware of what these smartwatches has in store to offer. With the help of the above-mentioned Samsung Gear S3 Classic vs Frontier comparison, we can sum up what features you will get with which smartwatch. Both smartwatches are quite similar in terms of features, but the looks are different. If we look at the size and design, both watches are a bit different. The size of Frontier is 62 grams, whereas the size of the Classic is 57 grams, so the Frontier is slightly heavier than the Classic. The appearance is also a bit different although the dimension of both watches is similar that is 46.1 x 49.1 x 12.9 millimeters. Both smartwatches have a built-in S-health app, which tracks all day activities, so whatever you do throughout the day, it will be recorded, be it heart rate tracking, calories burned, steps, distance, sleep stages tracking, etc. Samsung Gear S3 Frontier and Classic both have built-in GPS, gyro, Ambient Light sensor, accelerometer, and a barometer. Both Samsung watches are water-resistant and dust-proof. The point to be noted that both watches are only water-resistant, which means they are only good for splashes and you can also go out to have a walk in a rainy day, but you can’t imagine keeping a track of your swimming activity with either watch as they are not swim-proof. Both have a non-removable battery with a capacity of 380 mAh. The battery life of both watches is 4 days and can be charged with a wireless charger. The Samsung Gear S3 Frontier and Classic both works on Tizen operating system. Apart from design and size, another difference between the Samsung Gear S3 Frontier and Classic is the voice calling feature. The Samsung Gear 3 Frontier allows you to use voice calling, while Classis lacks it. 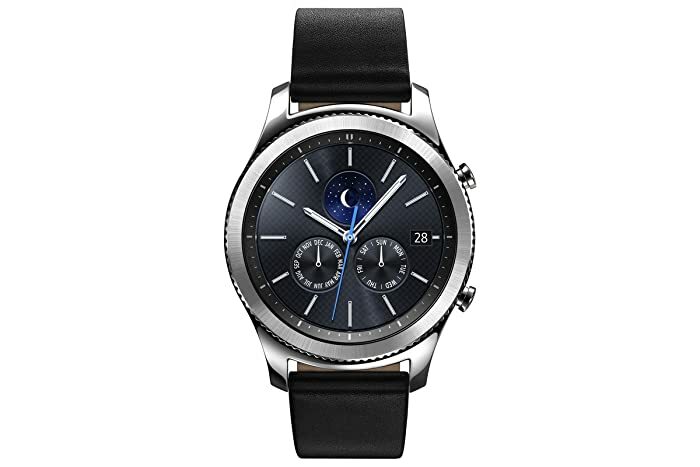 If voice calling option is important for you, then you should pick Samsung Gear S3 Frontier. The Samsung Gear S3 Classic has a music player that is not found in the Samsung Gear S3 Frontier. All in all, both smart watches have almost similar features, storage, processor, connectivity option, display, and battery life. In this article, we discussed the Samsung Gear S3 Classic vs Frontier comparison. According to most of the reviews, both smartwatches are good with awesome features.